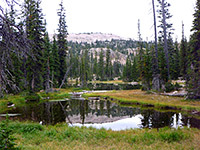 Because of the varied scenery and views, over a relatively short distance (4 miles), the Lofty Lake Loop is one of the most popular trails in the Uinta Mountains, crossing undulating terrain just north of Bald Mountain Pass, the highest point on the Mirror Lake Highway. The trail runs right beside four lakes, several ponds and a flower-filled meadow, and has good viewpoints of different areas of the mountains; north down the long Hayden Fork valley, east across many other lakes to Hayden Peak and the Uintas ridgeline, and south towards Bald Mountain. Either side of Lofty Lake, at 10,820 feet the highest on route, are two minor summits, both easily climbed to give an even better panoramic view of the surroundings. The route can be hiked in either direction but anti-clockwise is preferred since the elevation gain is done at the start, and the gradient is a bit more gradual. 12 views along the Lofty Lake Loop. Start point for the Lofty Lake Loop is the Pass Lake trailhead, located in a clearing in the forest on the north side of Highway 150, opposite the shallow lake. The path on the east side of the parking lot ascends gently at first through typical pine woodland, then has a longer, slightly steeper climb of a rockier hillside with fewer trees, giving the first views of two prominent summits to the south (Bald Mountain and Reids Peak). The route continues past a pond, a little way above the small but pretty Picturesque Lake, and across a vehicle track to the larger Scout Lake, which has wooded surroundings except to the north, where low cliffs rise up, with the high mountain crest visible beyond. 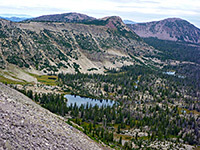 Some moderate climbing over boulders brings the path above the treeline and across a white rock plateau beneath a small summit to the north (Lofty Peak). The final part of the ascent, somewhat steeper, leads to a boulder-covered saddle, beyond which the land slopes down a short distance to Lofty Lake. Another small summit (Scout Peak) rises to the south, but Lofty is slightly higher and has different views to the remainder of the hike so this is preferred as an off-trail diversion. The hillside slopes up evenly to the flattish, elongated summit, which is formed of jagged white boulders, covered by green and grey lichen, sheltering some patches of stunted pine trees; the other peak is more earthen and less rocky. The best view from Lofty Peak is northeast, over a flat, sparsely forested basin containing about a dozen lakes (those named are Fir, Jewel, Naomi, Hayden and Ruth), while beyond is the wooded valley of Hayden Fork and the Uinta crest on the horizon. After returning to Lofty Lake, the trail continues along the southern shoreline, over a flat area and down via a few switchbacks to another saddle. Close by to the north, a little lower in elevation, are Cutthroat Lake, Teal Lake and several unnamed ponds, at the head of a tributary valley of Hayden Fork; the land opens out beyond and the views extend a long way north. 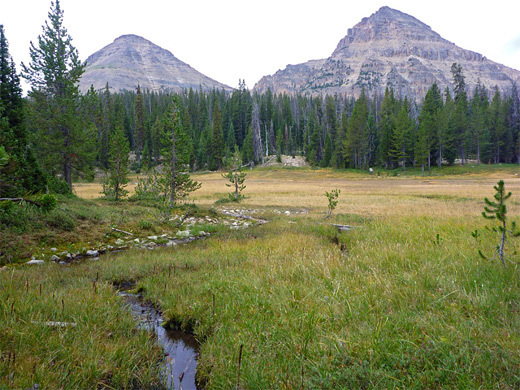 The path crosses a grassy bowl containing a shallow pond (dry by late summer), re-enters the forest and has a short, steep descent over loose stones to Kamas Lake and its adjacent pond, the inflow to which is regulated by a sluice gate. The east side of the lake lies beneath a big scree slope, angling upwards towards Scout Peak. Another steep, rocky descent takes the path down to a marshy area and then to the north edge of Reids Meadow, where it crosses five tiny, trickling streams, meandering across the pretty grassland. The final section climbs gently through the forest past two junctions, the first signed Holiday Park and Cuberant Lake, the other a short connecting path to Highway 150.